Hello! 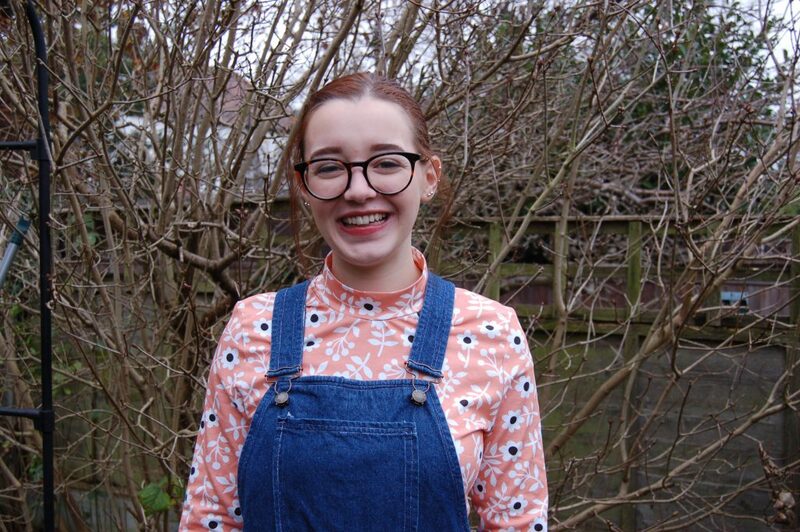 Today, we have a guest blog post from none other than Harriet from The Little Dressmaker! 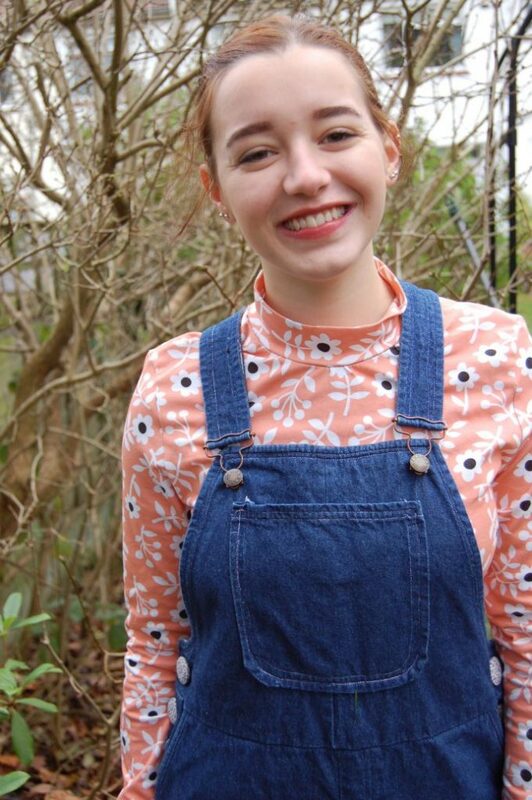 Harriet used one of our gorgeous Albstoffe organic jerseys to make herself a Tilly and the Buttons Freya top and she looks cute as a button in it! 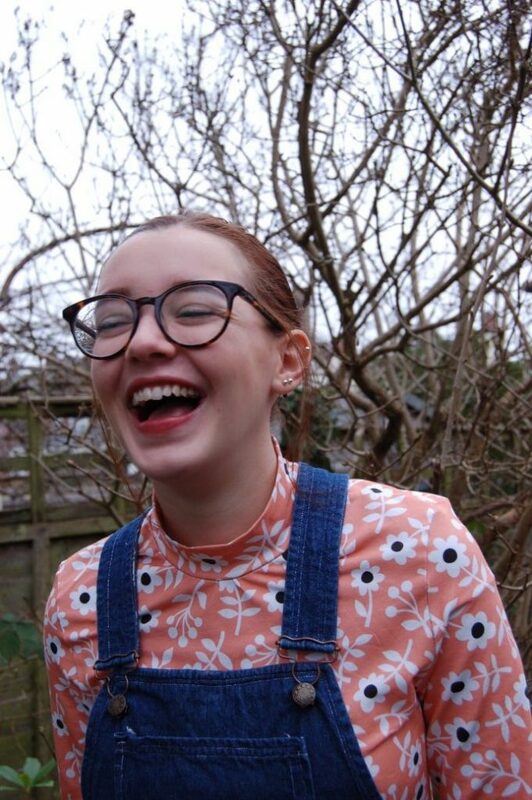 Today I’m writing about a lovely little Freya top I’ve made from the Mono Flower Jersey fabric in peach, from the German manufacturer Albstoffe. As I’m sure everyone will understand, all I want to do when the weather gets a little bit nippier is wear jersey from head to toe – and this organic cotton-spandex mix is the perfect fabric! I’m a big fan of using sustainable fabrics for as many of my makes as possible (my life goal is to live a life that means David Attenborough would be proud of me), and this jersey is GOTS-certified, which is a real badge of honour in the way of sustainability. Not only that, the quality of the jersey is incredible! It’s a t-shirt weight, and just feels expensive, you know what I mean? 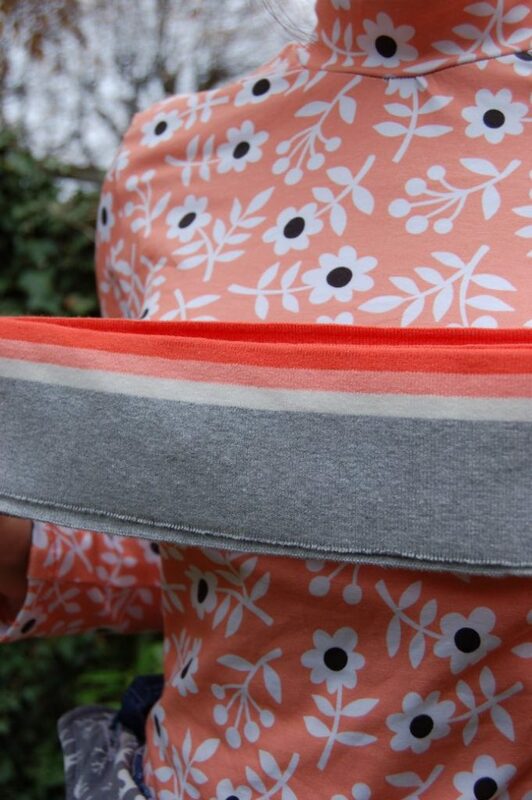 Originally, my plan had been to make the Tilly and the Buttons Stella Joggers – I’d bought the ‘Cuff me College’ (also Albstoffe and GOTS certified) in a light grey with coral and red pink bands, which I was going to use for the waistband and ankle cuffs of the joggers. 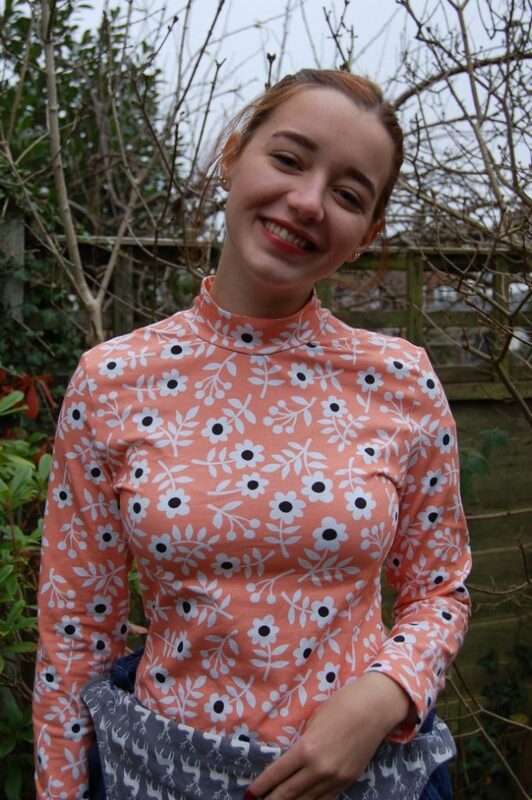 In the end, I decided to use the peach floral jersey to make the Tilly and the Buttons Freya top instead, because I, like most sewists, am a very impatient maker and always want to wear my newest make right away – and I feel like I might’ve had to wait until spring to wear the joggers! I’m really pleased that I changed my mind and went for the Freya top instead; it’s so versatile! I didn’t include the ruffle this time because I knew that I’d want to use it as a layering piece, so the ruffle wouldn’t have been seen most of the time anyway and would just end up adding unnecessary bulk. I’ve been wearing it underneath my dungarees, Kew dresses and Francoise dresses so far as an extra layer of warmth, but I’ll definitely be wearing it with the grey Stella joggers with the Albstoffe cuffs I mentioned earlier, because the peachy/coral colour matches perfectly.